We are at a critical point in the economic development of our country. We can let our middle class society continue to decline. In doing so, we will erode both the foundation of our democracy and the engine of our economic growth. Or, we can make saving and rebuilding our middle class society an enduring, unequivocal legislative priority at all levels of government. 1.7 Section 1. CONSTITUTIONAL AMENDMENT PROPOSED. vibrant democracy and critical to the long-term prosperity and stability of a republican form of government; and as a middle class society is supported by the public investment in basic building blocks to create opportunity, to guarantee its survival and growth, Congress will commit to provide by law and to protect for its citizens an economic and social environment conducive to living wage jobs, a clean and safe environment, a comprehensive public education system, a stable and functioning transportation system, and access to affordable comprehensive health care. Further, Congress will resist changes to this commitment and its means of support that will undermine the survival of the economic opportunity created by the existence of a middle class society committed to greater income equality. Click on the link above (MC_Amendment 2009 final copy) and read the organizing booklet and join the movement. 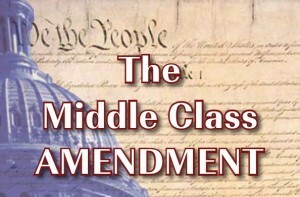 Your thinking on bolstering the middle class is right on point. It echoes back to the war on poverty initiated by Lyndon Johnson in the 1960s which made college education available to millions of low-income students through grants and national-direct student loans. The huge influx of a colleged-educated workers in the late 1970s thanks to President Johnson’s initiative was in large part responsible for the expansive growth in the economy during the late 1980s and 90s. Solid public education, including widely available college education, is essential to an enlightened democracy and a viabrant economy. Getting this message out is vital. Keep up your excellent work! !